Our strongest vision formula to date! 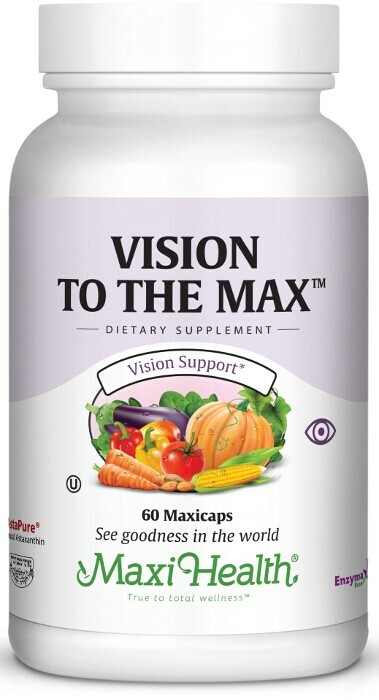 Treat your eyes to Vision To The Max™, our most advanced formula yet. We have included your favorite ingredients and then some! Selenium, Bilberry extract, Eyebright powder, Citrus Bioﬂavonoid Complex, Alpha Lipoic Acid, Coenzyme Q10, Turmeric powder, DMG, Green tea extract, L-Glutathione, Zeaxanthin, and Natural Astaxanthin. Let your eyes know that you really care, get your Vision To The Max™ today. Take two (2) Maxicaps™ once or twice daily, or as directed. Other Ingredients: Vegetable cellulose (capsule), rice ﬂour, magnesium stearate, Enzymax® (calcium carbonate, bromelain, papain, lipase, amylase, protease, silica). This product contains NO animal products, wheat, sugar, salt, yeast, gluten, milk, artiﬁcial ﬂavors, colorings or preservatives.